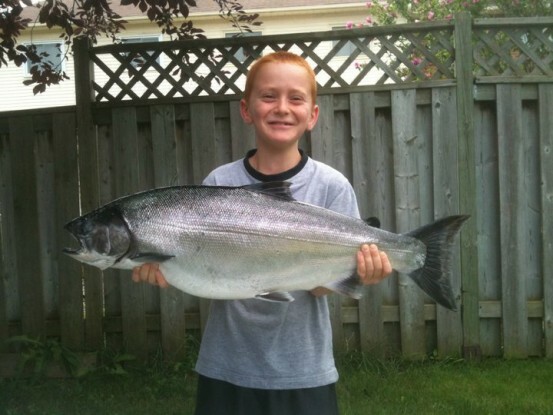 In late August, a friend of mine asked if my son and I wanted to join him for a day of fishing on Lake Ontario. To be honest, my experience fishing on the big pond has never been very productive but hey, it was a day of fishing ... a day with a friend ... and best, a day away with my son Wesley. Of course I said yes! We woke to just before the alarm at 3:30 am and stumbled our way to the kitchen to have a quick breakfast before hitting the road for our one hour trip south. My son was so excited, he could hardly contain himself. How many fish will we catch Dad? Will I be able to catch a big one and land it myself? A thousand questions rolled from his mouth but that was fine ... this was a day he would not soon forget. When we arrived at Bluffer's, we helped my friend launch the boat and load in our gear. The water was relatively calm and the gentle breeze that was forecast had not yet arrived. We made our way out of port and then raced out approximately four miles south to an area my friend said had been producing some pretty big fish. When we arrived, the gear was setup and the lures were lowered to approximately sixty-five feet. In less than twenty minutes, the first line went off. Wesley was first up and the line was going crazy. This was no small taker at the end of this line. My friend asked me if he thought Wes was going to be able to manage the Jonah-sized monster. I had no idea but I blurted out, SURE HE CAN! The fight was on and Wesley was not going to give up. Just as he seemed to gain a bit on the fish, it would dive back down to the murky depths of Lake Ontario. After about twenty minutes of fighting, the exhausted fish surfaced and Wesley managed to pull the Twenty-five point nine (25.9) pound monster to the net. We brought it aboard and stood it beside Wesley to get a full appreciation for the size. It was two-thirds the length of my boy but the smile on Wesley's face was two-thirds the size of the Great Lakes Basin. That was the first salmon of the day which ended up producing about six monsters, the stories for which get bigger every time we tell them.